Until the state works out licensing rules, selling pot is still a crime, but the delay is pushing entrepreneurs into a growing underground market. Jack Sargent sees a bright future in marijuana. 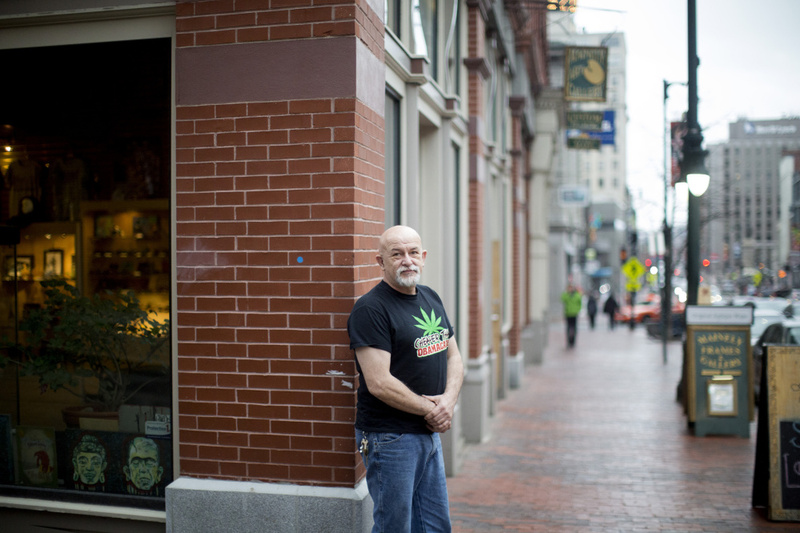 The retired grandfather of nine wants to grow his Biddeford-based business, The Cannabis Shack, to cater parties – think weddings and barbecues with marijuana-infused food – and open a storefront cannabis bakery. He’s already perfected his recipes, including an “award winning” Hell Sauce 420 hot sauce, brownies and infused salad dressings. But at least until next year, when the state plans to issue retail licenses, Sargent isn’t allowed to sell any of it. While marijuana use is now legal for adults 21 and over, selling it remains a crime and obtaining it without breaking the law is difficult. A search of Craigslist reveals Sargent has some competition. A service named Leafy Delivery promises free “cannabis gifts” to people willing to pay for delivery. The delivery fee is based in part on the quality of marijuana strain that the customer wants delivered. Maine voters legalized marijuana last November and the law took effect in January, but until the Legislature works through the extensive rule-making process, no one is licensed by the state to legally sell the drug. Licensed retailers are not expected to be up and running until February, at the earliest. So while adults are legally allowed to possess up to 2.5 ounces of marijuana and grow their own plants, they typically must turn to the underground market to buy the drug, or even obtain seeds to plant. It is legal to accept free gifts of marijuana, but the law says the person giving away the pot can receive nothing – money, services or items – in return. The limbo between legalized possession and legalized sales is leaving some locals and tourists frustrated and shifting the recreational drug from the black market into a new gray market, where entrepreneurs like Sargent are beginning to push the boundaries. While Maine law enforcement agencies have yet to crack down on the practices, similar business ventures have been deemed illegal in other states. Boyer and others say the delay between legalization and the opening of retail stores pushes otherwise law-abiding citizens to an underground market where there is no oversight and where people can become victims of crimes. But others – including law enforcement officers concerned about issues such as more people driving cars while high – say the state needs time to work through the complex task of setting up regulations without rushing into retail sales that will dramatically increase access to the drug. 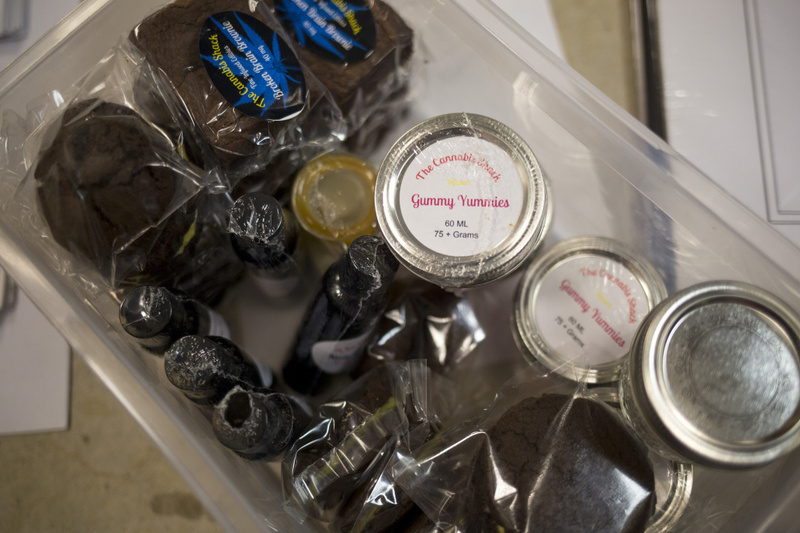 Jack Sargent’s marijuana-infused products – free with a donation – include Broken Brain Brownies, Silly Sauce dressings, Nasty Little Honey Shots and Gummy Yummies. He plans to apply for business licenses once the state starts issuing them next year. The emergence of operations such as The Cannabis Shack and Leafy Delivery to fill the void isn’t unique to Maine. Other states that legalized recreational marijuana also had a lag time before retail sales began, and officials in those states encountered – and shut down – businesses that advertised free marijuana for customers who were willing to pay for the bag it came in or pay for an unrelated product that would be delivered with the free weed. Officials in Springfield, Massachusetts, ordered a shop to shut down in early March after they said it was illegally selling marijuana. The city issued a cease-and-desist order to Mary Jane Makes Your Heart Sing because the owner was charging a $20 to $50 entry fee that could be put toward the purchase of items from the store, which sells things like glass pipes and vaporizers. Customers would leave the store with a free “gift” of marijuana, The Associated Press reported. In Boston and Washington, D.C., a startup called HighSpeed Delivery has been giving customers “free” marijuana with orders of juice, apparel and art. In Boston and Cambridge, an $11 bottle of strawberry juice can be upgraded to a $55 bottle with “love.” That love, according to a Boston Globe reporter who bought some last month, was a small bag of marijuana. The Massachusetts public safety agency has urged district attorneys to investigate these types of transactions. There has yet to be a test case in Maine. Although searches of Craigslist and Facebook turned up The Cannabis Shack and Leafy Delivery, several Maine police officials said they have not seen those types of businesses. They also said they have not seen an increase in illegal marijuana sales, but acknowledge pot has been a low priority for Maine law enforcement for years. Vern Malloch, assistant chief of the Portland police, said his department hasn’t come across new businesses selling marijuana illegally, but also said police haven’t necessarily been out looking for people trying to take advantage of loopholes or gray areas of the law. While Malloch said his department hasn’t come across anyone giving away marijuana in exchange for donations, he said it is something his department would investigate. He would need to consult with the Maine Attorney General’s Office for guidance, he said. 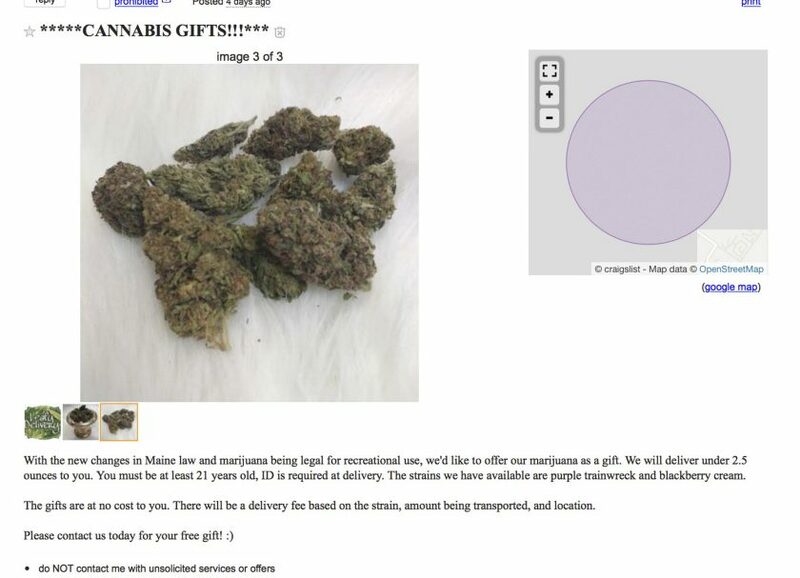 A Craigslist entry shows an offer from Leafy Delivery, now known as Elevation, which brings pot as a free gift to a user who pays a delivery fee based on the strain and the amount being transported. The listings for Leafy Delivery’s cannabis gifts began appearing on Craigslist within the past two weeks, popping up in event services listings along with wedding photographers, catering services and birthday party buses. Logan Fisher, who has been a medical marijuana caregiver in southern Maine for the past few years, said he started advertising his Leafy Delivery service – he’s since changed the name to Elevation – to gauge the demand for marijuana in the Portland area. At 28, he’s banking on a future in the cannabis industry. In an email response to the Craigslist ad, the service said two strains of free cannabis – Blackberry Cream and Purple Trainwreck – were available for delivery to the Portland area. The pot is free, it says, but delivery charges vary based on both the volume and the strain. Delivery for Blackberry Cream was $75 per quarter-ounce or $130 per half-ounce, while the delivery charge for Purple Trainwreck was $60 for a quarter-ounce or $100 per half-ounce. As Mainers celebrate legal marijuana, where does new law draw the line? The delivery prices quoted by Leafy Delivery roughly correspond to the average prices for high-quality marijuana and low-quality marijuana in Maine, according to a web-based global price index for marijuana. The Price of Weed, a website that relies on people to submit what they paid for cannabis in different parts of the world, lists average prices of an ounce of marijuana in Maine as ranging from $259.13 to $296.95, depending on quality. Street weed bought from underground drug dealers is generally cheaper in and around states near Maine, Florida, Michigan and on the West Coast. Consumers in the Midwest, mid-Atlantic region and Washington, D.C., pay significantly more for pot, according to the price index. Sargent, of The Cannabis Shack, offers a mix of free products and services, but includes a prominent note on its homepage about how donations are used to cover packaging and handling. The company will plan marijuana-infused dinner parties, weddings and barbecues. A menu of cannabis-infused edibles available on the website includes Broken Brain Brownies, Silly Sauce dressings, Nasty Little Honey Shots and Gummy Yummies. For each product listed on the website, Sargent includes a set donation price, ranging from $15 for brownies to $35 for salad dressings. “This is our award-winning infused hot wing sauce. Not for the lite of heart!” the description reads. A 3-ounce bottle of hot sauce is $30, payable by Paypal or credit card. After the donation, Sargent makes arrangements to meet up with people to give them the products. Sargent said he has been making edibles for years and that he is currently doing it in a local rented kitchen using marijuana he gets from people he met when he used to build grow houses. People find out about his products mainly through word of mouth, but recent links to his website posted on Facebook generated a lot of interest, he said. He took down the Facebook posts because he couldn’t keep up with the number of requests, he said. During this month’s First Friday Art Walk in Portland, Sargent sat behind a table inside a Congress Street business, an elaborate wood sculpture he made displayed on the table in front of him along with platters of cheese and crackers and bottles of wine. The only indication that Sargent was handing out marijuana edibles was his T-shirt, which featured a large pot leaf and the words “Cheaper than Obamacare.” Most people find him through word of mouth, he said. Tucked away behind Sargent was a plastic tote filled with pot-infused brownies, cookies, gummies and lotion. Small bottles of his most popular edible – the Nasty Little Honey Shot – rounded out the supply. Sargent plans to look for an investor and apply for business licenses once the state starts issuing them next year. In the meantime, he’s not that concerned about how law enforcement will react to his website. While entrepreneurs such as Sargent are trying to take advantage of the gray market and gear up for legal retail sales, they also are responding to a new level of demand, according to people on the fringes of the industry. The arrival of operations like Leafy Delivery and The Cannabis Shack comes as no surprise to Kevin Conley, an employee at Awear, a shop in downtown Portland that specializes in glass pipes and other supplies for marijuana use. He said he often fields questions from customers – especially people visiting from out of state – about where to buy the now-legal pot. Boyer – who also is often asked by people where they can buy marijuana – said it wasn’t unexpected to see people try to “fill a vacuum where there’s obviously a demand, so much so that people are willing to meet a stranger on Craigslist to buy marijuana.” Boyer said the lack of a legal, regulated marijuana marketplace fuels sales on the black market. Boyer said he would like to see the Legislature – which has set up a committee to develop marijuana regulations and retail licensing rules – allow some early marijuana sales by state-licensed medical marijuana dispensaries. And, he said, the state should lift the cap on the number of dispensaries – it’s now at eight – to allow smaller-scale medical marijuana suppliers known as caregivers to apply to act as dispensaries. Falmouth Police Chief Ed Tolan, president of the Maine Chiefs of Police Association, doesn’t want the state to rush the rule-making process and supported the Legislature’s vote to delay sales until February 2018. He said police officers across the state are still adjusting to the new law and have concerns about how to deal with impaired driving because there is no simple roadside test to determine if someone is impaired by marijuana. The police chiefs association brought to Maine a former district attorney from Colorado to do multiple training sessions for officers and administrators about recreational marijuana and issues they should be prepared to deal with. When the Legislature finishes its work setting up a regulated marketplace, officers will undergo more training on the new law, Tolan said.